La Turbie is a town slightly north of Monaco on the French Riviera, on the spectacular Grand Corniche road that runs from Nice to Monaco - one of the great scenic highlights of this region. 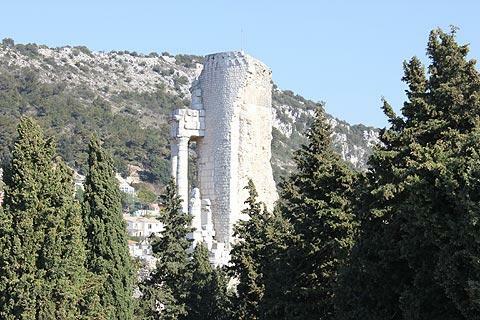 Apart from the village itself, and the beautiful views from the corniche, it is the great Roman monument in La Turbie that attracts visitors - it dominates the village from its high position. 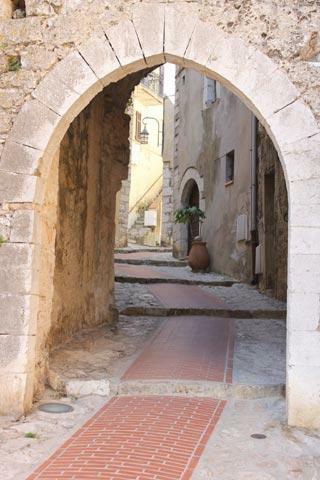 The medieval village in La Turbie is small but nicely preserved. 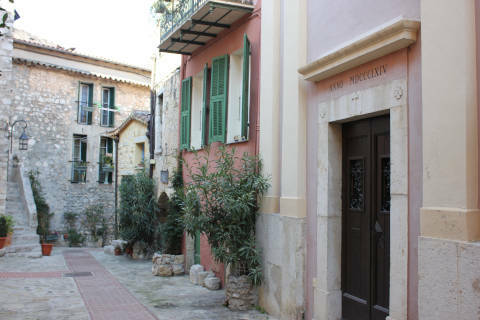 The village itself developed around the imposing roman monument and is well worth exploring. 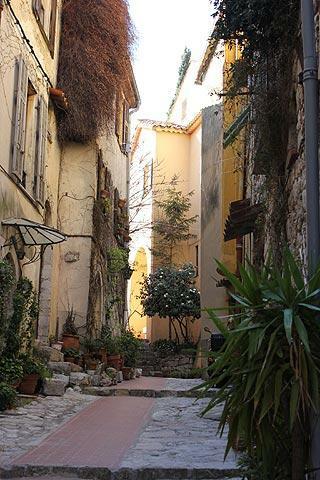 You enter the village through a medieval stone gateway and discover pretty medieval streets and alleys lined with exotic plants and bouganvilleas, with a pretty square in the village centre where you can see a small chapel among the colourful houses. One highlight in La Turbie village is the little Church of Saint Michel, a baroque style church built in the middle of the 18th century. Inside the church you can see many paintings and frescoes and a decorative altarpiece. The cemetery above the village also offers views of the Trophy des Alpes and the mountains behind. Outside the historic center the rest of La Turbie is less interesting to visitors. There was a market when we visited (Thursday) but it was a 'cheap clothes and mattresses' market rather than one of the traditional Provencal markets that we all love to visit. Known as the 'Trophy of the Alps' and built around 6 BC, the large monument once featured a great statue of the Emperor Augustus atop a circular building surrounded by columns, itself standing on a very large stone pedestal. 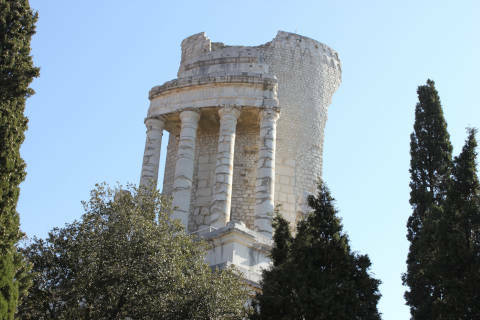 At that time the location was on the boundary between the Roman empire and Gaul that stood beyond and the monument was intended to be an imposing sign of the power of the Roman empire and to celebrate the victory of Augustus over the gaulish tribes of the region between 25 BC and 14 BC. The statue is no longer, and the structure substantially fell into ruin and destruction over the intervening centuries and much of the village of La Turbie was constructed with stone pillaged from the monument. 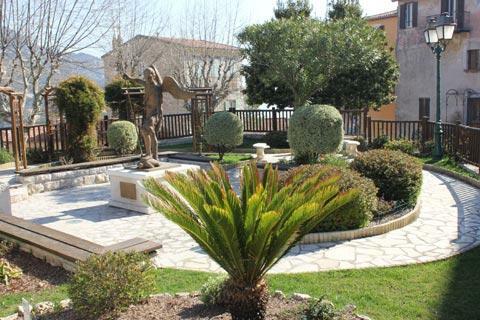 20th century renovation efforts have gone a long way to recapturing the glory of the monument and the plaque that marks the victories of Augustus over the tribes of Liguria for which the original monument was constructed to celebrate has also been restored. The monument is now surrounded by a lovely small park that overlooks the sea. There is also a small museum on the site, most notable for the scale model of the original monument that it contains. The trophy is a listed National Monument. The views from the monument at La Turbie are far-reaching and extremely impressive - among the best in the French Riviera (there is a belvedere to the left side of the monument where you can see a good part of the views without paying the admission charge to the Trophy des Alpes). 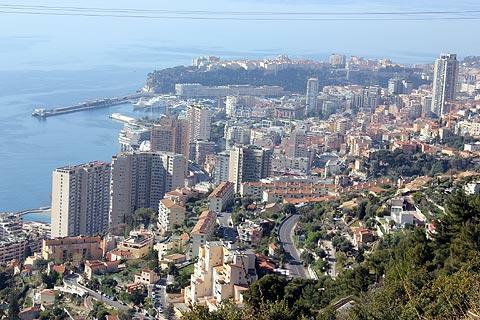 There are too many highlights in the region to list here, from magnificent scenery and traditional Provencal hilltop villages such as Eze to the glitzy resorts of the French riviera and the wealthy principality of Monaco. 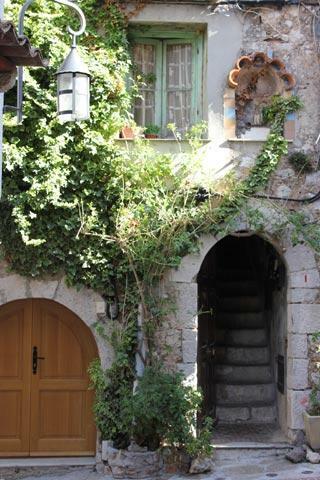 There is something close to La Turbie for everyone - see our Cote d'Azur guide for more information.